Not that there's any required weather for certain music, but when the sun is out certain songs come to mind. I have been waiting to post this song for a while now. Now, that it's warmer and the endless rain has ceased, it's seems fitting to match this gorgeous day with a brilliant tune like this. 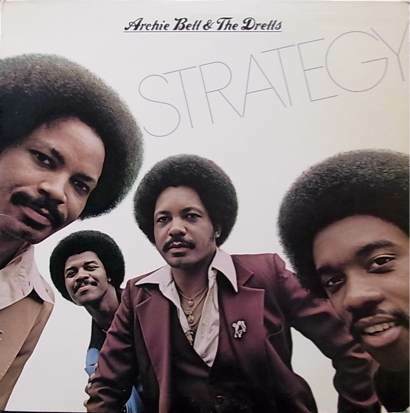 Most folks are familiar with Archie Bell And The Drells, everybody knows the 'Tighten Up' and the famous rap about Houston, Texas. But, less people are familiar with their later material. They actually continued on quite well later in their careers. Some of their late 70's LP's are quite nice like this 'Strategy' album from 1979. I first heard this song on the ever famous 'Death Mix' by Afrika Bambaataa. I can't remember how long ago it was when I first heard 'Death Mix' on cassette tape, but when I revisited it 5 or so years ago, when I bought a vinyl re-press, I realized this was the one tune that I never found out who it in fact was. Local DJ Kool Kyle played a strange compilation that featured this and a few of the other 'Death mix' breaks called 'Voodoo Death Breaks' if I remember correctly. I set out, like I always do, to find out who this tune was by like my life depended on it. I asked teems of local and non-local DJ's, those with endless knowledge and those just starting out learning. I left no stone unturned. I was quite disappointed that a lot of my 'break' collecting peers and elders didn't know. Ultimately NO ONE seemed to know. Perhaps a few knew, but fell back on an older more secretive code of ethics. At last, Joe Quixx suggested that it was Archie Bell. I didn't even play it for him, I just referenced Bambaataa's mix and described the break with my own spin on beat boxing. Not something under normal circumstances anyone should be subjected to. Well, like the true hip hop pioneer and 'old-school' sound genius that he is, he was right on the money. It took a little while to track down which song this was, and from what album, but here it is now for you. Every other Archie Bell LP that I've found have all been great. Truly these guys kept the soul alive even throughout the darkest disco hour. Joe Quixx has been a huge inspiration to me. From the days of his Wake Up Show involvement, to the trenches of the 5-7 day a week club schedule he keeps to this day. He made me proud blasting Tom Scott's 'Today' and 'The Bird' By Jimmy McGriff on FM signal boosted commercial radio waves waaaaay back in the day. He was schooling folks back then, and is a integral part of Bay Area Hip Hop history. Also a member of the Oakland Faders. But, above all else, Joe is just a good dude. 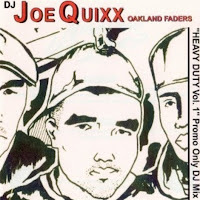 Hats off to you Joe Quixx...the original 'Latin Soul Brother' Make sure you click on this photo to get his 'Heavy Duty' mix. It's ironic, but we both named a mix we did 'Heavy Duty'....like minded brothers I suppose. I could not help but to edit this a little tiny weenie bit. It's not something I do often on this blog and always lean towards posting the original track, from original vinyl as it first came out. But, in true 'Ultimate Breaks And Beats' fashion I've worked the breaks to be just a little bit longer. It sells the song that much better. Those of you that download all these songs and use them on your Serato...well, now you have a convenient edit to use. Thank me by selling me your old records. wrong link fixed 4-7-11 cheers enjoy!